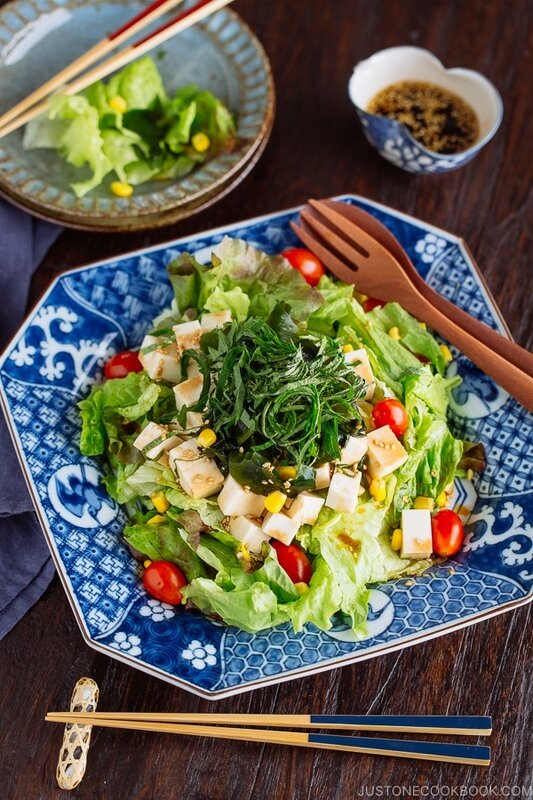 This easy Japanese Tofu Salad with Sesame Ponzu Dressing is a refreshing salad with leafy greens, tofu, corn, wakame seaweed, and fragrant Japanese herb – shiso leaves. You’ll love the tangy ponzu sauce too. 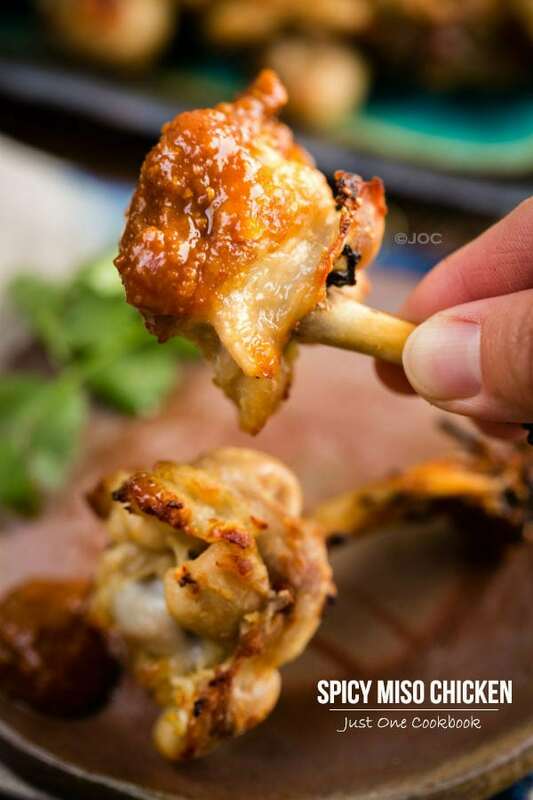 It is super easy to make and goes well with many Japanese and Asian dishes. So make a big batch! 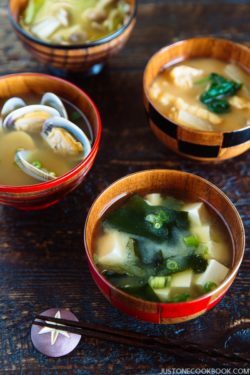 When I make Japanese style meal, I try to plan out the meal by following the Japanese Ichiju Sansai – “One Soup Three Dishes” rule, which involves one main dish, 2 sides, steamed rice, miso soup, and pickles. On a busy day (most weeknights, frankly speaking), I don’t have time to prepare two kinds of side dishes, so one of them tend to be an easy salad that I can put together in no time. 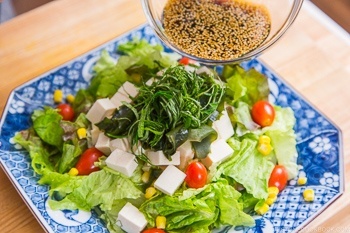 This Tofu Salad with Sesame Ponzu Dressing (豆腐サラダ) is my go-to salad recipe for over decades and it’s always my family’s favorite. Many of you have asked me if we can eat the tofu without cooking it. And the answer is yes, you can eat the tofu out of the package which is sold in the grocery store’s refrigerated section. 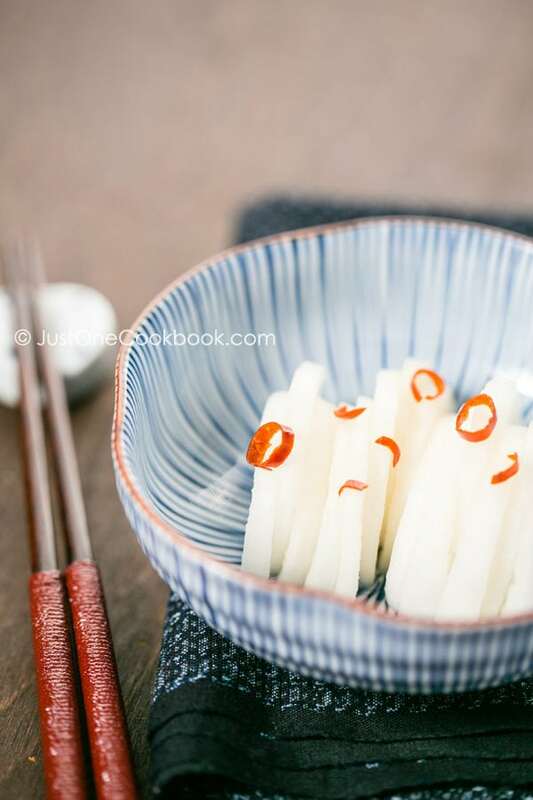 In the summer months, we eat Hiyayakko, which is a cold tofu as an appetizer or side dish. 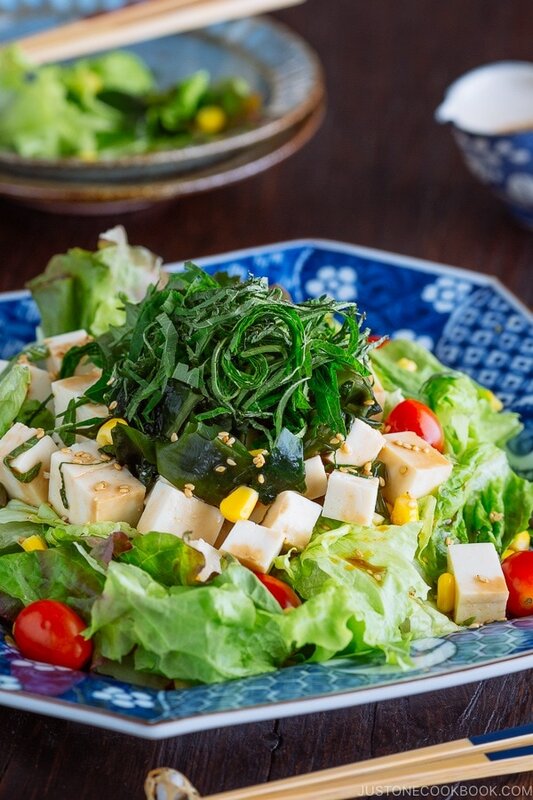 Tofu salad is sort of an extension of Hiyayakko, served with leafy lettuce and other colorful ingredients. 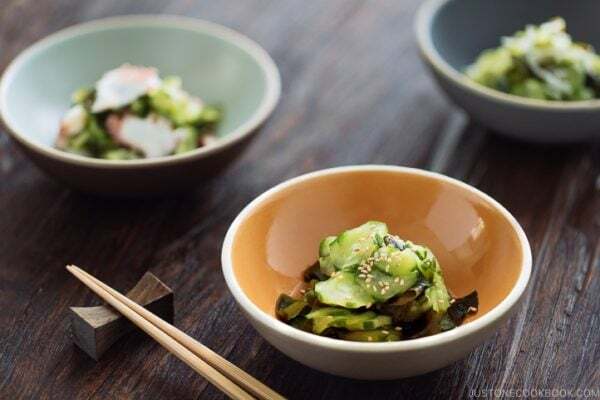 With soy sauce, ponzu, sesame oil, and sesame seeds, the dressing goes well with any Japanese-style meal or other Asian dishes. Ponzu (ポン酢) is a citrus-based soy sauce packed with umami from kombu and katsuobushi (dried bonito flakes) and tanginess from citrus fruits. 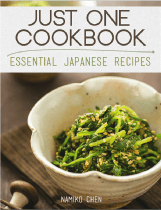 If you love ponzu, I would suggest making your own Homemade Ponzu following my recipe. 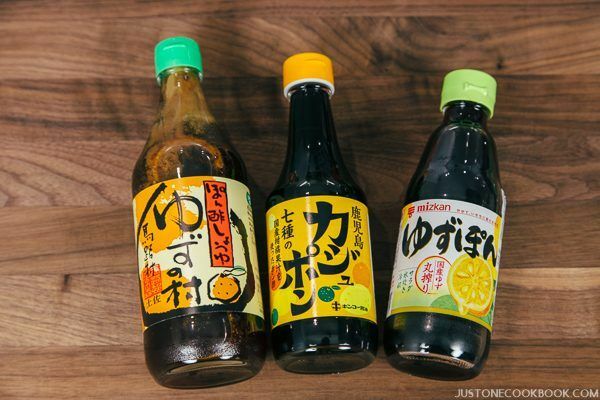 It’s super easy and delicious, and you will not buy a bottle of ponzu from grocery stores anymore. 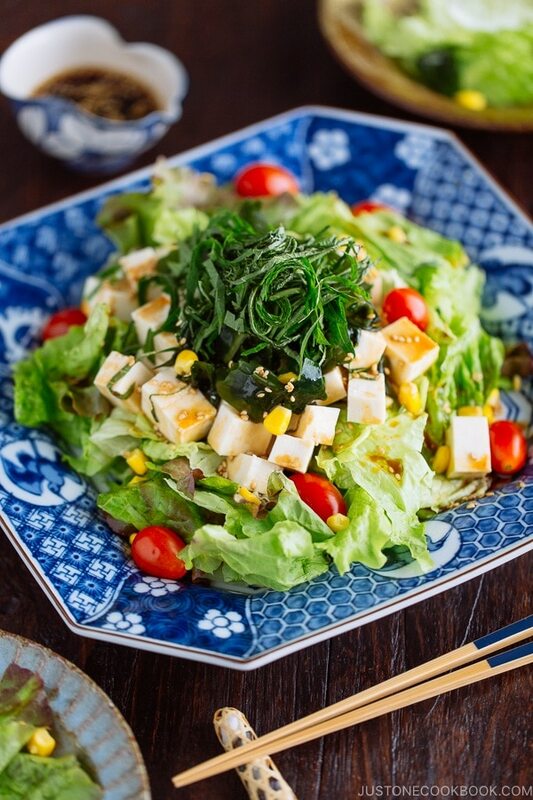 The acidic portion of this dressing comes from the citrus ingredients to make ponzu. If you decide not to use ponzu in this recipe, make sure to add rice vinegar or other citrus fruits to compromise the acidic part. Sometimes having too many choices can be a bit confusing, such as variations of tofu. 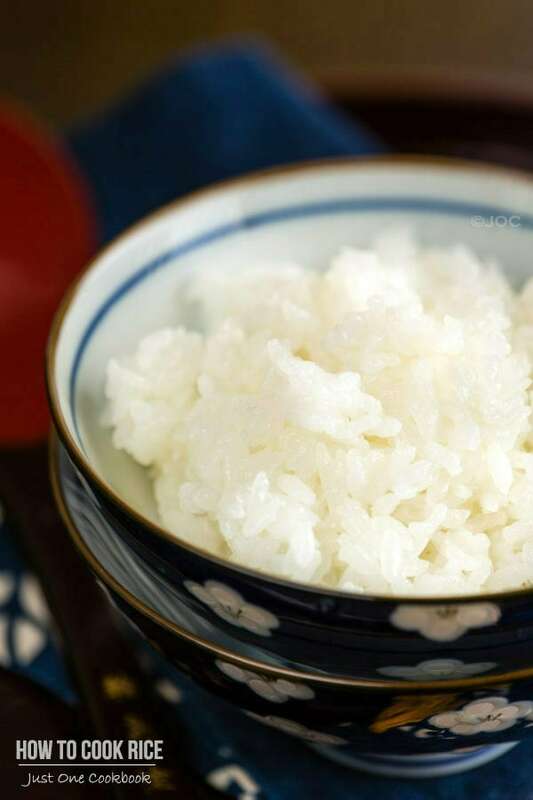 Different tofu brands offer different level of softness, but in general, we have Kinugoshi Tofu (絹漉し豆腐; “silk-filtered tofu”) and Momen Tofu (木綿豆腐) in Japan. 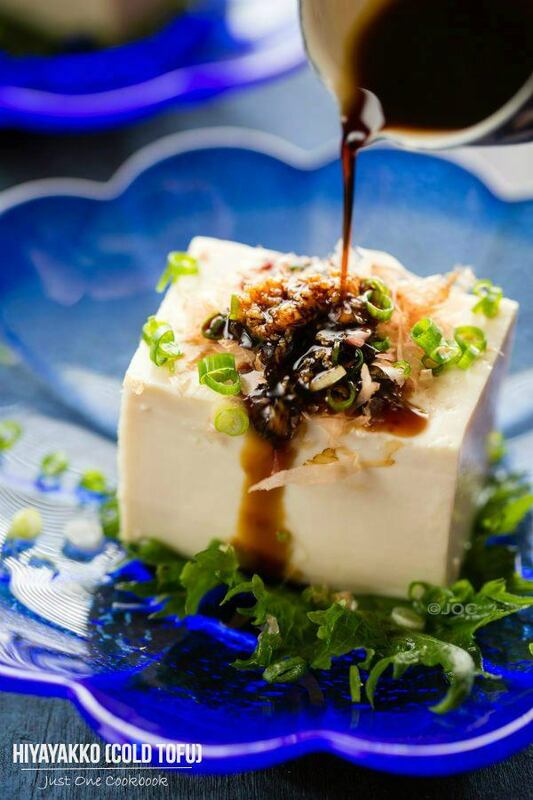 Typically for tofu salad, we use silken tofu as the texture is smooth and soft. For this salad dressing recipe, I use sesame oil instead of vegetable oil. Sesame oil has a nice fragrance and it is known for its effect to trigger one’s appetite. If you don’t have sesame oil, use neutral flavored oil such as vegetable oil (for example, olive oil is not considered “neutral flavor”). Yuzu Kosho (柚子胡椒) is a paste made from chili peppers, yuzu peel, and salt which is then allowed to be fermented. It’s a wonderful condiment that I highly recommend searching for when you visit a Japanese grocery store. 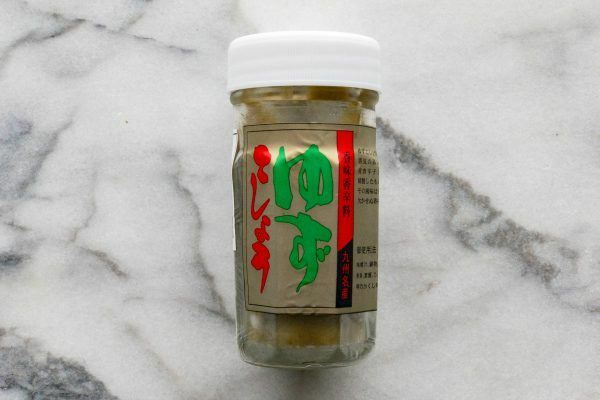 I LOOOOVE to add a bit of this paste in my miso soup. Adding just a touch of yuzu kosho paste in the dressing adds some spicy and umami kick. There is nothing like this condiment. You can get this brand of yuzu kosho on Amazon (I’ve never tried it, so I can’t say much about the quality). If you did decide to buy it, let me know what you think. This Japanese herb is one of my favorites and it’s worth growing in your own garden if you can’t find it in your local Japanese grocery store (you can find the seeds from Kitazawa Seed Company). 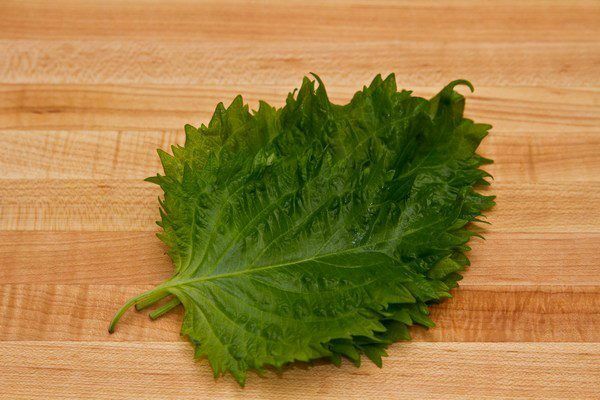 There is no good substitute for it in terms of flavors – the closest would be Korean/Vietnamese perilla leaves. 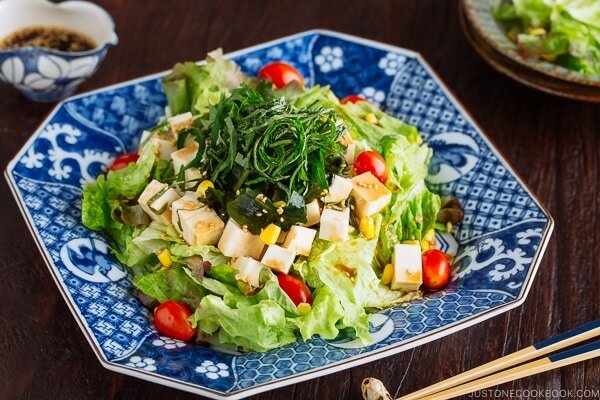 Shiso leaves give pleasant fragrance and flavors to the salad. 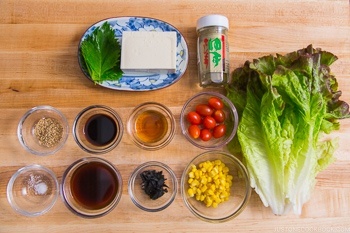 If you can find them in your Japanese grocery store, you must grab them to add to this salad. 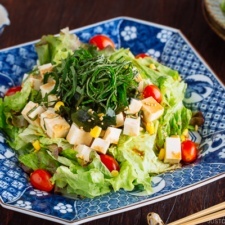 Tofu is the star of this salad, but if you are not a big fan of tofu, there are other ingredients you can choose which go well with Sesame Ponzu Dressing. What else would you like to add? 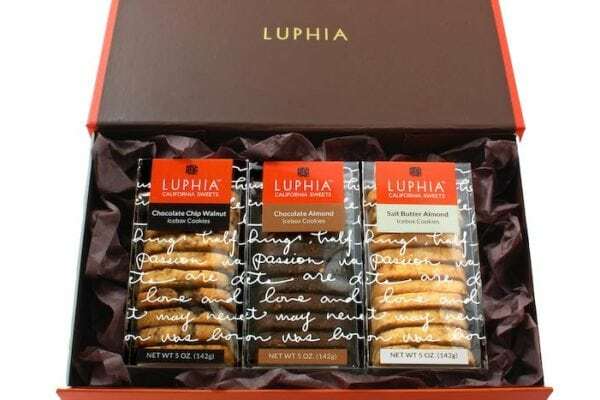 If you tried this recipe and have some good suggestions, let us know! Put dried wakame seaweed in water to rehydrate for 10 minutes. Once wakame is soft and tender, squeeze water out and set aside. 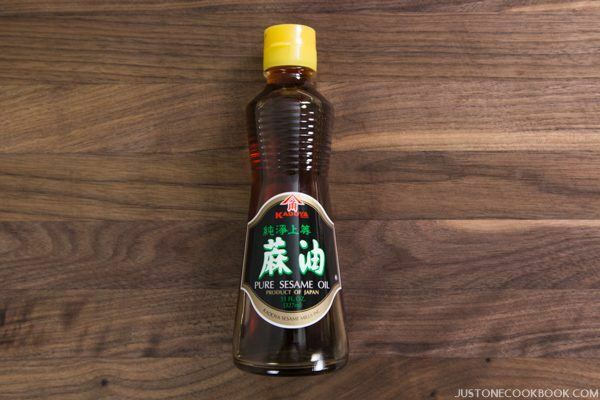 In a small bowl, combine 3 Tbsp Ponzu, 1 Tbsp soy sauce, 1 Tbsp sesame oil, and ⅛ tsp Kosher salt. Add ½ Tbsp white sesame seeds and ⅛ tsp Yuzu Kosho (optional and more for spicy taste). Whisk all together. Stack shiso leaves and cut into julienned strips. Cut the lettuce into bite size pieces and place on the serving platter. Top with corn kernels and cherry tomatoes. Place the tofu, wakame seaweed, and shiso leaves. When ready to serve, drizzle the dressings and put some remaining on the small cup/bowl. Editor’s Note: The post was originally published on January 20, 2011. New images have been added and the content has been updated in July, 2018. Thanks Wendy for leaving a comment here on my website (so now I learned how it appears in my FB page as well). Kombucha adds savory flavor and acts like salt + kombu dashi. It’s nice to have, but you don’t need to get it just for this salad. I have other dishes that needs Kombucha, and you might want to buy when you cook them. Hope you like the salad! Nami, i really enjoy reading your cookbook even though i rarely cook myself…do you have super easy recipe for lazy people like me? This looks so good! 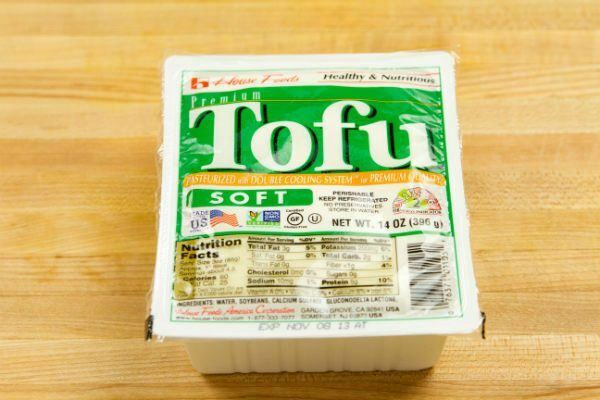 I love tofu! It’s been a whole week since I have had any so I need to go fix that! Hi Elyse, Sandra, and Carmella – thanks for stopping by. The dressing is amazing, and I hope you’ll like it. ohhhh that looks so beautiful! Loveee all the colors of your salad! I love this dressing. I think I could sip it from a cup. When viewing the Food Gallery and clicking on this recipe, it took me to the Sweet Onion Takikomi Gohan recipe, so the link may be broken. I have always cooked the tofu even if it means boiling in water for a short amount of time. Can you eat it without cooking it?